4.0 out of 5 based on 113 bloggers and 23 commenters. 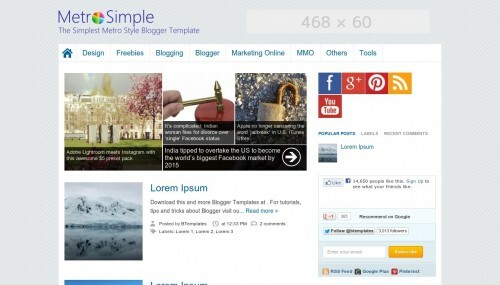 Metro Simple is a free premium blogger template with 2 columns, right sidebar, an exclusive design for Blogger, ads ready, footer columns, slider, social bookmarking icons, posts thumbnails, tabs, drop down menu, a background pattern and well designed threaded comments. Excellent template for blogs about software. You are promoting templates from someone who steal my designs and my code as well, and this not enough but he trying to sell my templates. I didn’t know about that situation, however, I think you need to solve this issue directly with Nguoiaolam’s author, unfortunately, I can’t work as moderator. If there is a problem with this template particularly, please, let me know. No sé cómo instalar los artículos destacados, dónde hay que poner el código que viene? As I reply to you, I so sorry about this issue and I remove all things connecting with any deluxetemplates. you can check it directly. @Mikel: En el link de “Template settings” vienen las instrucciones. Mikel, es difícil saber cual es la razón de los errores de Blogger, debiste haber echo alguna modificación equivocada, como puedes ver en el demo, siguiendo las instrucciones del autor la plantilla funciona. Te recomendaría empezar de nuevo. The Beauty of this templates is the Dynamic Thumbnail on the top but that doesn’t work with the one we download, so what’s the point????? Hello, wanted to know how to remove the hacker’s “Read More” Thank you. Muy buena plantilla, viene con diseño responsive? woo this is a nice template. sir i wanted to know how to remove Attribution from my blog. I can’t seem to find the social Icons no where after installing your template. I looked through the code and couldn’t find it. I also looked at the gadgets and it wasn’t there. Did I miss it in the code? Thanks for the help, Im not used to working with Java Script!